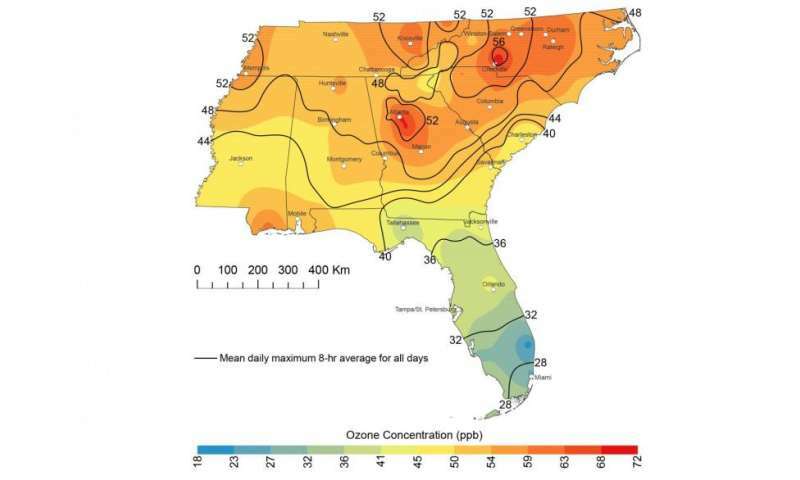 Global climate change may produce an environment in the southeastern United States that could foster dangerous extreme heat events, more high-ozone pollution days in urban areas, and the potential for the growth of tropical diseases by the mid-21st century, Georgia State University researchers have projected. The research was published in the Public Library of Science journal PLoS One, and was conducted by Dr. Jeremy Diem, associate professor of geography in the Georgia State College of Arts and Sciences, as well as Dr. Christine Stauber, associate professor of environmental health, and Dr. Richard Rothenberg, Regents' Professor and associate dean for research and faculty in the School of Public Health. Using data collected at weather stations as well as global climate models, researchers projected that most of the Southeast will have apparent temperatures similar to that of present-day southern Florida, which has a tropical climate. Apparent temperature in the summer is often referred to as the heat index, what humans perceive as the temperature to be based on a combination of humidity and the actual air temperature. Higher apparent temperatures and more extreme heat days could lend themselves to more heat-related illnesses, and potentially more deaths. The research suggests the summer atmosphere may also be more conducive to extremely high ozone concentrations, a hazard to individuals with lung diseases such as asthma, as well as the elderly. Higher summer temperatures are favorable for the growth of mosquitos capable of transmitting arborviruses, such as dengue, resulting in the potential for transmitting dengue at rates similar to tropical areas. The research team suggests these harmful health effects could be addressed through changes in the built environment, such as extensively implementing green and cool roofing in urban areas, potentially reducing urban temperatures. Public policy changes could help to continue a current decline in emissions contributing to ozone, mitigating the new summer climate's effects on ozone pollution. Improving public health infrastructure, increasing standards of living and increasing access to healthcare could also decrease the effects of heat events and tropical diseases that might result from an increase of mosquitos. Better seasonal climate forecasting can also help the Southeast prepare for extreme heat and tropical-disease transmission. It's always nice to see such well validated models and rigorous data collection used to predict the future. It just warms my cockles.